Liangjiang New Area is China's third national-level development area and it boasts incomparable advantages compared to other inland areas in the country, such as convenient transport and logistics. Chongqing Jiangbei International Airport is the largest international airport complex in China, Guoyuan Port is the largest harbor in the upper stream of the Yangtze River, and Longtou Temple Railway Station is the largest railway hub in western China, as well as the most complex highway network and the largest information harbor in central and western China - in addition to a good industrial foundation. Liangjiang New Area has pooled the dominant industries of Chongqing - including automotive, electronic information, equipment manufacturing, instrumentation, bio-pharmaceutical, financial services and modern logistics - and has formed a relatively complete industrial supporting system with comprehensive functions. Liangjiang New Area also has the Lianglu-Cuntan Bonded Area - the only bonded area in inland China - the financial center in the upper reaches of Yangtze River and one of the largest gathering zones of corporate headquarters in central and western China. 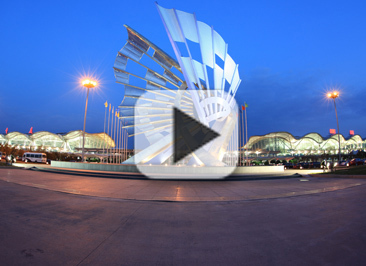 The Yuelai International Expo Center, the largest exhibition center in the central and western regions of the country, is also in Liangjiang New Area. The area also has great potential for further development. The newly-developed construction area in Liangjiang New Area covers 400 square kilometers. The industrial land accounts for 60 percent of the city's total land. The residential land accounts for 40 percent, and the public land accounts for 60 percent of the city's total land. The prices of industrial water, electricity, gas and manpower are approximately 30 percent cheaper than that in coastal areas in east China. Liangjiang New Area has a free policy environment comparatively and benefits from preferential policies including the campaign of Development of the West Regions. It also benefits from policies as a pilot zone for reform and coordination of urban-rural integrated development, and as an inland bonded port with pilot policies similar to that in Pudong New Area and Tianjin Binhai New Area. The State Council has granted Liangjiang New Area unprecedented preferential policies and required that support for Liangjiang New Area's development shall be strengthened in order to attract industry, capital and talents. Liangjiang New Area - the inland area in China that benefits the most from its policy advantages - has released a series of policies, including a reduction in corporate income tax to 15 percent, winning widespread attention from global investors.